Dog teams have a very special role in the world of search and rescue. A trained dog's extremely sensitive hearing, night vision, endurance and keen sense of smell have continually proven to be invaluable in the effort to locate missing persons. Because of their extraordinary abilities, dogs are often able to reduce the search time and thereby increasing the chances that the person will be found alive. The success of search dog use stems from the fact that every human being has a different smell (not detectable by humans) which is caused by the constant stream of dead cells and bacteria shed from the human body. On command, a trained search dog will scan the air current for human scent while moving rapidly through an assigned area. When the dog identifies airborne human scent, it will quickly work to the source of the scent and on finding a human subject, return to the handler and give a trained behavioral indication. Using grid search techniques, a dog team working down wind of their assigned search area, can quickly clear large sections of the search area. 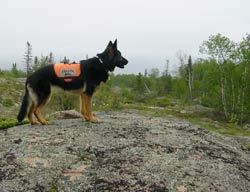 Search and Rescue dog teams are best called early in the search, but can be effective days or weeks afterward. They can work in many situations and surroundings including dense brush and high grass, wooded areas, on the water, in snow avalanches, rock and mud slides and in and around collapsed structures and debris. Air scenting dogs can work after other searchers have been through the area, in any type of weather, day or night, and after extended time lapse of days or weeks since they seek only the - airborne scent coming directly from the subject. 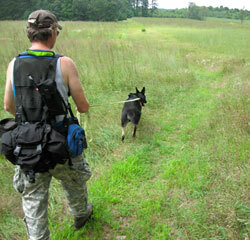 Many of our dogs are trained for tracking as well as air-scent work. Tracking skills add another dimension to the dogs search capabilities and can prove to be an important resource when appropriately deployed. All our k-9s must complete a rigorous certification process that starts with a basic open field problem and ends with night search and multiple subject evaluations. As mandated by ARDA affiliation requirements, there are six levels of evaluation that test the dog and handler's ability to detect and locate missing subjects under a variety of conditions. While finding missing subjects in wilderness and rural settings is our primary mission, many of our k-9 teams are trained for other specialties. Several of our teams are trained in cadaver detection and crime scene preservation and have worked successfully to help resolve criminal investigations. HSAR dog teams have worked successfully in locating deceased subjects in early and late stages of decomposition. Contact HSAR directly for more information on cadaver and water search capabilities. K9 Laska working in Rainbow Falls, Provincial Park, Ontario.